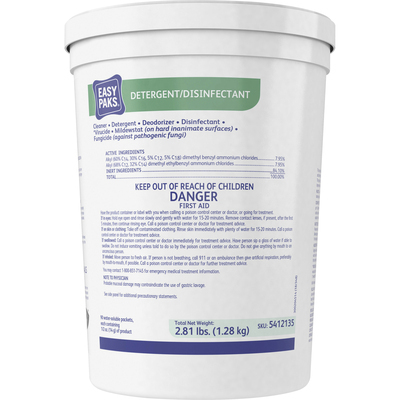 Multisurface Detergent/Disinfectant In Easy-To-Use Packets Lets You Quickly Clean Surfaces Without Any Guesswork, Waste Or Messy Cleanup. Effervescing Action Ensures That Both The Cleaner And Packet Will Dissolve Completely In Water. Versatile Formula Is Effective Against Bacteria And Viruses Including Hiv-1 (Aids Virus) And Controls Mildew. Detergent/Disinfectant Is Designed For Use On Inanimate, Hard Surfaces Such As Walls, Floors, Sink Tops, Tables And More..
Multisurface Detergent/Disinfectant In Easy-To-Use Packets Lets You Quickly Clean Surfaces Without Any Guesswork, Waste Or Messy Cleanup. Effervescing Action Ensures That Both The Cleaner And Packet Will Dissolve Completely In Water. Versatile Formula Is Effective Against Bacteria And Viruses Including Hiv-1 (Aids Virus) And Controls Mildew. Detergent/Disinfectant Is Designed For Use On Inanimate, Hard Surfaces Such As Walls, Floors, Sink Tops, Tables And More.